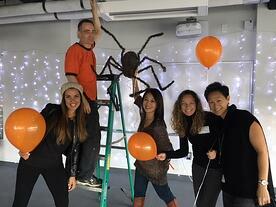 Fall Mixer and Halloween Photo Booth Pics! Below are some fun videos and photos from our recent celebrations. Students in Grades 8-10 requested an off-campus outting for the Fall Mixer this year, so they hit the lanes together with faculty and staff chaperoning. 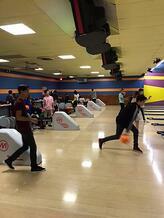 Someone even managed to capture a video of Mr. Berman demonstrating how to bowl a strike! The night was full of spares, strikes, food, and good company in a venue complete with an arcade to add to the fun. 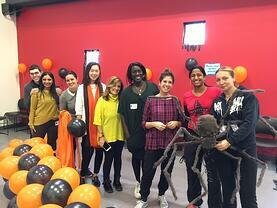 The Friday before Halloween our younger grades had fun afternoon full of candy, costumes, and dance music thanks to the efforts of our staff and some great parent volunteers. Costumes spotted all around the halls of 556 included Pokemon, Star Wars, Harry Potter, and zombies galore. The photo booth was by far the most popular attraction at the event. Click here to see all the photos snapped! Thank you so much to Mr. D'Amato for manning the DJ booth in our Senior Lounge, and the Walser-Subramanyam Family for compiling a fantastic playlist for our 3rd Floor dance. A big thank you as well to the parents who came out to decorate our halls!! !